Wow, I didn't mean to go a full week without posting. 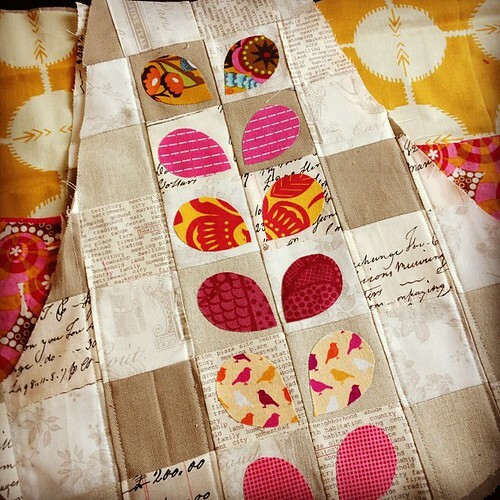 I have still been sewing, just not doing a great job of documenting or photographing lately. Also, I am in the midst of a few unfinished projects that seem kind of redundant to keep filling you in on. Yes, I am still obsessed with the scrappy trip along! It is so much fun. 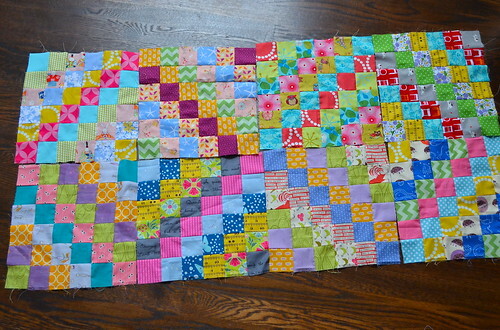 The actual sewing is fast, but the cutting of strips is so time consuming for me. 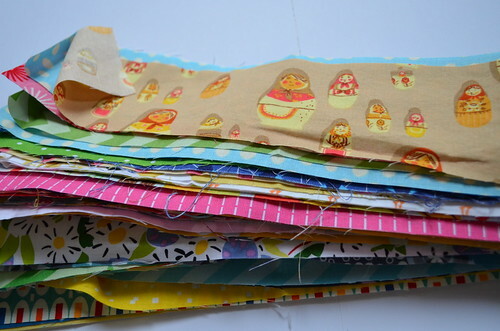 I've already used most of the strips in my scrap bag that are big enough to work, so now I've moved on to using fat quarters and stash. Glad to be using it, but ugh, the folding everything up and putting away part is no fun. I need a clean up fairy! I do have plenty to keep me going! I have been feeling a bit anxious about not starting on my Sew, Sew Modern Swap gifts yet, so I am glad to finally have a plan. This is using the 241 and based off of this amazing pillow Jolene made. I figured I can use the same tutorial for scrappy trip around the world and just mix the blocks up a little bit more to randomize the patchwork. I am so relieved to finally have a plan. I was crippled with indecision for so long! 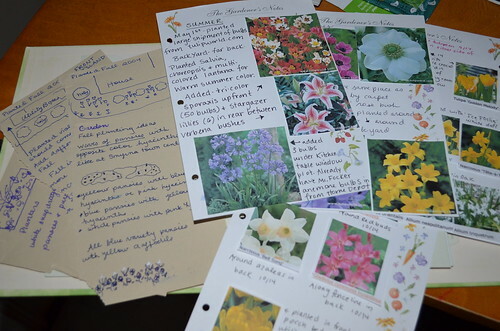 Oh, and I while doing my annual organizing craziness I came across a "Gardener's Organizer." It almost went into the goodwill bag (I love garden, but could hardly see myself writing anything down about it), until I realized at some point I had used it. Before kids, clearly. I actually used to print out pictures of all the bulbs I ordered and drew diagrams of where I planted them all in the yard. Crazy! Have a great weekend! It is supposed to be 70 degrees here Saturday and Sunday, so probably not much time sewing here! I love your projects, Courtney! That 241 tote is going to be stunning! ooh, cutting up some precious pretties for the trip! love it! and i love seeing your garden notes. i never had a place to garden pre kiddos, but can empathize! That 241 tote is going to be amazing! Hehehe, tidy up as you trim! What is that? I push them into a pile and tidy up and put them away after the quilt is done, theoretically anyway! I love your garden plans. Definitely before kids! Great projects! Love your trip along.